Join us for the 12th KNIME Spring Summit at bcc Berlin Congress Center, Berlin from March 18 - 22, 2019. As with previous Summits, there'll be leading data scientists there, highlighting how they use KNIME Software for solving data problems across industries such as telecommunications, retail, life sciences, manufacturing, finance, and more. We've also got our KNIME courses on offer, giving you the chance to extend your KNIME knowledge, plus an exciting social program, providing plenty of networking opportunities. 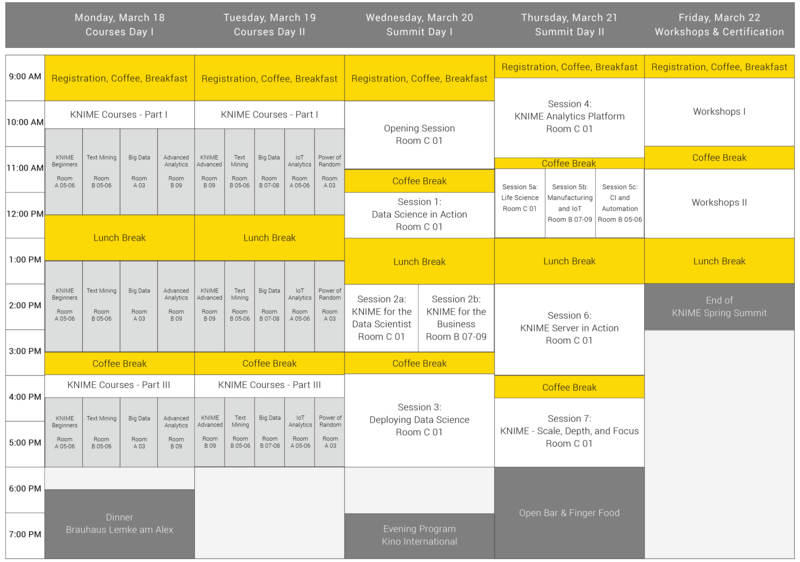 We'll also be running a KNIME Server half-day workshop on Friday, March 22. Watch this space for more details. This year we’re introducing a new course – the KNIME Refresher Course. We’ll take a step back in time and look at the last four versions of KNIME Analytics Platform and all the neat features that have been released. This will include a usability update, an introduction to our newest machine learning nodes – including how to use the H2O nodes – the latest workflow orchestration nodes, and more. This will be a hands-on session where you’ll get to try out these nodes in action, on real examples. We'll be in Room A 04. We’re offering this course in two time slots: Tuesday morning and Tuesday afternoon. Once you’ve completed your summit registration, we’ll reach out to you with details on how to sign up. We're inviting those who are interested in learning more about development at KNIME to join us at one - or both - of the following sessions on Tuesday afternoon. This meeting is intended for software developers and requires programming skills in Java. We'll be in Room A 08. 1:30 PM - 3:30 PM: Developer Crash Course. In this session, we'll show you everything you need to know in order to write your own nodes. Based on a simple KNIME node, we'll show you what classes are required and what methods must be implemented. All participants should know how to program Java and ideally also how to use the Eclipse SDK. Please bring your own computer with a current installation of Eclipse SDK. 4:00 PM - 6:00 PM: Open Session. This is an open, informal session about all things related to development! If there’s anything in particular you want to discuss, please let us know upon registering and we'll try to get it included in the agenda. We'll conclude with a networking session including food and drinks from 6:00 PM - 9:00 PM. If you're interested in attending either of these sessions, please register at dev-summit-2019@knime.com with your name and company/affiliation. At this year's summit, we're hosting a poster session on Thursday evening to offer a dedicated space for thoughtful discussions. Use this opportunity to show how KNIME Software facilitates your work/research, as well as current challenges. 10:00 AM - Opening Session. Room C 01. 12:00 PM - Session 1: Data Science in Action. Room C 01. Session 2a: KNIME for the Data Scientist. Room C 01. Session 2b: KNIME for the Business. Room B 07-09. 4:00 PM - Session 3: Deploying Data Science. Room C 01. 9:30 AM - Session 4: KNIME Analytics Platform. Room C 01. Room C 01. Session 5b: Manufacturing and IoT. Room B 07-09. Session 5c: Customer Intelligence and Automation. 2:00 PM - Session 6: KNIME Server in Action. Room C 01. 4:30 PM - Session 7: KNIME - Scale, Depth, and Focus. Room C 01. In cooperation with OpenMS from the University of Tübingen and SeqAn from the FU Berlin, this workshop will provide a brief introduction into the analysis of mass spectrometry and sequence data with KNIME. We'll demonstrate how to utilize the two tools in KNIME in order to build workflows that retrieve and analyze common life science data and then use standard KNIME nodes to further process the results. The workshop is recommended for users who are familiar with KNIME and who would like to learn more about using OpenMS and SeqAn to process data from life sciences. Sensors, machine-to-machine, and network data will play a leading role in analytics as the Internet of Things becomes a reality. In this workshop you will get an introduction to the most important methodologies, algorithms and ideas in IIoT Analytics. You will learn to access sensor-based data sources, understand the fundamentals of digital signal processing, realize the importance of smart feature engineering, and use advanced methodologies to uncover underlying patterns or concepts contained in IIoT datasets. All KNIME hands-on examples are based on real-world IIoT datasets. In this workshop we'll demonstrate the new KNIME Deep Learning capabilities. We'll discuss how to create, fine-tune, and extend new or existing Keras models in KNIME Analytics Platform to solve a variety of analysis problems such as image or text classification and time-series analysis. Random Forests and Gradient Boosted Trees in KNIME - Dean Abbott (SmarterHQ). This workshop describes why Random Forests and Gradient Boosted Trees are so much more accurate than individual decision trees or even other ensemble approaches (such as Bagging). We'll also look at examples of how to build them in KNIME, and provide practical warnings of how they can fail. You’re currently using the open source KNIME Analytics Platform but want to work across teams and business units? KNIME Server is the enterprise software for team based collaboration, automation, management, and deployment of data science workflows. Non experts are given access to data science via KNIME Server and WebPortal, or can use REST APIs to integrate workflows as analytics services into applications. We introduce you to KNIME Server capabilities and cover everything you need to manage your analytics at scale - deploying your workflows for sharing and collaboration, scheduling and automating tasks, templating and version control. We demonstrate the power of the REST API of KNIME Server and WebPortal - the ideal way for bringing data analytics to your business users. KNIME Text Mining with NER Modeling and Deep Learning - Julian Bunzel and Andisa Dewi (KNIME). In this workshop, you'll learn how to train your own, customized named entity recognition model, how to apply it to extract entities from text, and create entity relation networks. Furthermore learn how to transform textual data into numbers to feed them into deep neural networks (LSTM) for prediction. This workshop provides a brief introduction into the analysis of images with KNIME Image Processing. We'll walk through several use cases from various fields including BioImage Analysis and Classification with Deep Learning, Car Counting, and more. We'll also provide a short overview of our current and future work. The workshop is recommended for users who are familiar with KNIME Analytics Platform and would like to learn more about KNIME Image Processing. In this hands-on workshop we'll work through a couple of examples of common cheminformatics use cases selected to give a broad overview of both what you can do with KNIME and what's possible with the RDKit. In addition to using the RDKit KNIME nodes, we'll also provide an example or two of how you can use the broader functionality available using Python and Java scripting nodes available in KNIME. In addition to learning some new stuff, you'll walk out with a couple of useful workflows that you can continue to adapt and use. This workshop focuses on automated machine learning and data visualization. After an initial introduction to automated machine learning, we'll split into two groups where each group will focus on one part of a simple automated machine learning application. The first group will build an input page to explore the data and insert the settings for the future machine learning steps: data preparation, model training, and hyper-parameter optimization. The second group will build the final dashboard to visualize model performance. At the end of the event, both pieces will come together to deploy a simple automated machine learning application on KNIME Server and to run from the WebPortal. Please bring your own laptop with KNIME Analytics Platform pre-installed. This workshop will show you solutions for advanced analytics on big data using KNIME's Big Data Extensions. It will cover advanced analytics with Apache Spark and in-database processing on Hive/Impala. Also, recent additions such as working with local big data environments and the possibility to run KNIME workflows directly on Spark will be shown. For accommodation, we recommend the following hotels which are within walking distance to bcc Berlin Congress Center: H4 Hotel Berlin Alexanderplatz, Park Inn by Radisson Berlin Alexanderplatz Hotel, and Motel One Berlin-Alexanderplatz.